The 8th Annual UN-SPIDER Conference, jointly organized by the United Nations Office for Outer Space Affairs (UNOOSA) and the Ministry of Civil Affairs of the People's Republic of China, was held in Beijing on 24-26 October 2018. 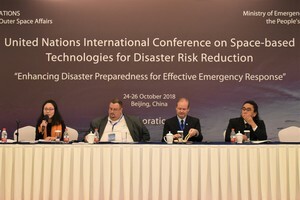 The ADRC representative reported latest Sentinel Asia activities and role of RSO in a session 1 on "Institutional strengthening and preparedness for improving emergency response using space technologies". Especially it was focused on an importance to escalate International Disaster Charter for data sharing with requestors. Also ADRC got an interview about past RSO activity and discussed about the next steps for the better of strong relationship. ADRC participated in the 25th Asia-Pacific Regional Space Agency Forum (APRSAF) co-organized by the Singapore Space Technology Association (SSTA), Japan's Ministry of Economy, Trade and Industry (METI), and the Japan Aerospace Exploration Agency (JAXA). 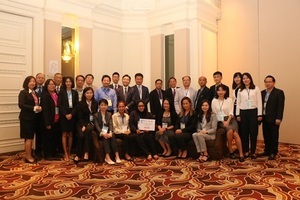 It was held in Singapore from 6 to 9 November 2018, and was attended by many stakeholders from Asia-Pacific space agencies, governmental bodies, international organizations, development aid agencies, private companies, universities, and research institutions from more than 40 countries and regions. APRSAF consisted of four working groups (WG), addressing space applications, space technology, space environment utilization, and space education), a small satellite development workshop, a workshop promoting the use of the Japanese experiment module "Kibo" on the International Space Station (ISS), and a plenary session. ADRC participated in the space application WG and reported on the operational status of Sentinel Asia. 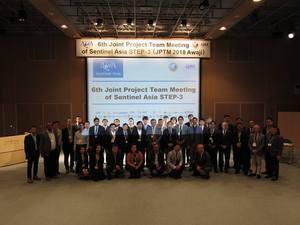 ADRC also gave a report at the plenary session on Sentinel Asia's past development, the strategic plan formulated by the Steering Committee of Sentinel Asia, and its endorsement at the JPTM held on Awaji Island in Hyogo, Japan last week. On the final day, the Chairman made recommended implementing the Sentinel-Asia Strategic Plan. ADRC continues to work on the promotion of Sentinel Asia while strengthening cooperation with related organizations.